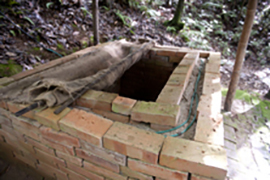 This technique is an adaptation of methods used to produce charcoal for fuel. Unwanted biomass, in this case from the forest weed banmara (Eupatorium adenophorum), is converted into charcoal in a charring drum and then turned into solid fuel bio-briquettes. The charcoal powder is mixed with bentonite clay at a ratio of 3:I, pressed into honeycomb-shaped moulds, and sun-dried. 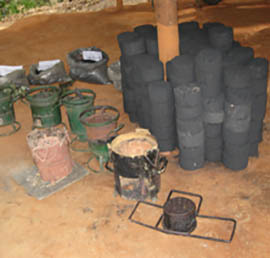 The bio-briquettes can be used for cooking or heating. 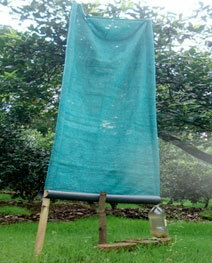 They can be ignited easily from below using waste paper or dried leaves and twigs. Once the lower portion catches fire, the flames start coming up through the nineteen holes in the briquette; the air flow ensures smokeless burning  a pollution free and environmentally friendly source of energy. Biobriquettes can also be make from industrial waste such as saw-dust and waste papers. This cool chamber uses the principle of evaporation to maintain a temperature that is 10-15°C less than the outside temperature, with a relative humidity of about 90 per cent. It can be constructed with locally available material like bricks, stones, sand, bamboo, straw, and gunny-bags and a small water supply. It can be used to keep produce fresh before transport to market, or for personal household use. It is suitable for remote mountain areas where there are no refrigerated cold storage facilities. The briquette press is used to produce non-polluting, non-charcoaled, compact briquettes from waste materials such as sawdust, rice husks, and paper. The waste material is first made into a slurry, then the press is used to expel the water and shape the briquettes. 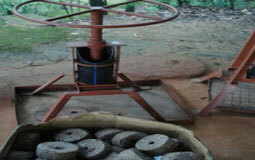 Briquettes produced from sawdust and paper are mainly used for cooking. One kilo of briquettes burns for about 2 hours in a briquette stove and produces enough heat to cook 2 meals for 4 people. Use of briquettes from discarded materials helps to reduce dependence on fossil fuels and fuelwood. It also helps reduce the volume of waste and minimises rubbish pollution. There are many kinds of improved cooking stove, designed with the aim of improving efficiency of burning and reducing smoke. Such stoves use less wood, thus contributing to environmental conservation, and reduction of the workload (drudgery) of mountain farmers, as well as offering health benefits through reduction of indoor air pollution. 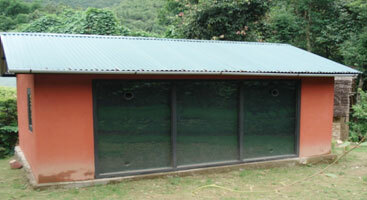 The following designs are demonstrated at ICIMODs site. Rocket stove: The rocket stove uses very little fuel and can burn light fuel such as wood, twigs, and dry weeds. The stove helps the fuel to burn efficiently at a high temperature by ensuring that there is a good air draft into the fire and complete combustion of volatile components. It can be used both indoors and outdoors. Trekkers stove: The trekkers stove is a handy, small, lightweight stove that burns fuelwood or compact briquettes cleanly without producing smoke. It is very efficient and can boil one litre of water in 10 minutes, making it an ideal cooking stove for up to 4 people. Medium size gasifier stove: The medium size gasifier stove can cook food for 25-30 people in about 1½ hours. The stove is efficient, produces little smoke, and can use either wood or briquettes as fuel. It can be used either indoors or outdoors. Annapurna conservation stove: This stove can cook food for 10-12 people. It is very efficient and can burn small twigs and branches, fuelwood, or briquettes without producing much smoke. Since ancient times, people have used thick walls to trap solar energy; thick walls absorb heat during the day and release it slowly to warm the building at night. Todays low energy consumption buildings often improve on this ancient technique by incorporating a thermal storage and delivery system called a Trombe wall. This is a massive wall separated from the outdoors by glazing and an air space -- it absorbs solar energy during the day and releases it towards the interior at night. The vertical Trombe wall is made of materials such as stone or concrete and is glazed on the outside. During the day, sunlight shines through the glazing and hits the surface of the thermal mass, warming it (by absorption). The air between the glazing and the thermal mass heats up (by conduction), and rises taking the heat with it (convection). The warmer air moves into the living space through vents located near the top of the wall, drawing in colder air through vents at the bottom. One-way flaps on the vents prevent backflow of warm air from the living space at night. In general, the vents are closed in summer when heating is not required. The vents are an improvement on the original Trombe wall design, which relied entirely on conduction by the thermal mass to transport heat to the living area. Most hill regions have thick dense fogs during the summer months, which offer a potential source of water. Fog water can be collected using large polypropylene mesh panels placed on ridgelines perpendicular to the movement of the prevailing wind. Water droplets in the fog condense on the mesh, trickle down a trough and drain into a collecting tank. Under favourable conditions, the system can absorb from less than 0.5 litres to more than 40 litres of water per day. The amount of water harvested depends on the geographic conditions and the season. Fog water harvesting is viable at altitudes between 1,500 and 3,500 metres. The advantage of fog water collection is that the system is passive (requires no energy input) and the water harvested can be used for multiple purposes uses including drinking, irrigation, and re-forestation. The technology is easy to construct and easy to repair and replace; it is also inexpensive to build and simple to maintain. 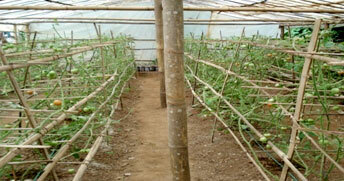 Drip irrigation is also known as trickle irrigation or micro-irrigation. It provides water slowly (2-20 litres/hours) to the roots of plants, either by depositing water on the soil surface or directly to the root zone. The water is delivered through a network of valves, pipes, tubes, and emitters or drippers (small diameter plastic pipes fitted with outlets), thus it is most suitable for row crops such as cauliflower, cabbage, tomatoes, tea, coffee and soft fruit plants. With drip irrigation, water is supplied to the plants more frequently (usually once every 1-3 days) but in smaller quantities than in other methods; plants flourish at this favourable moisture level.